Today after church, Pastor Adam and I are driving to Washington D.C. Adam is excited. If I’m honest, I am kind of dreading it. When I lived in Los Angeles, I worked 15 miles away from where I lived. It took me 90 minutes to get to work. I absolutely hated the traffic. My commute to work drove me crazy! 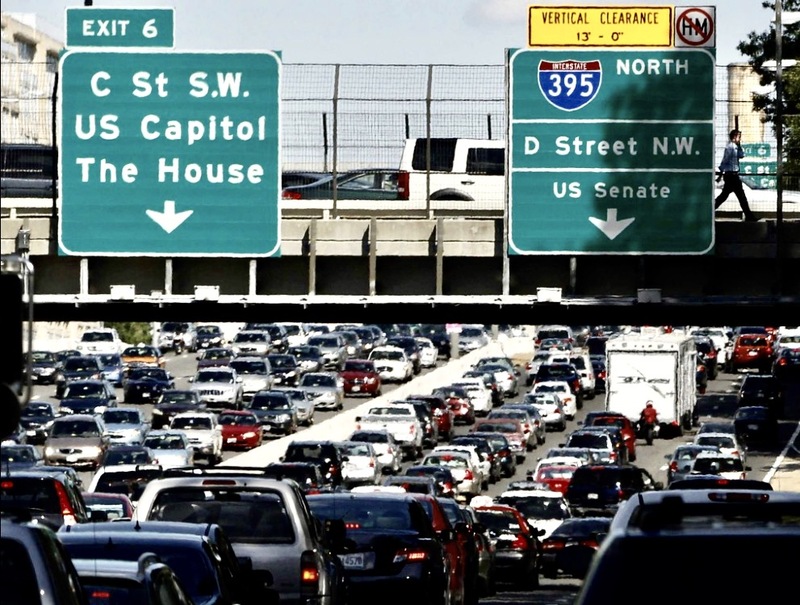 Did you know that D.C. has the worst traffic in the country? Today’s trip has given me traumatic ﬂashbacks of my time in California. I can still remember daydreams about flying cars and the possibility of teleportation . . . all while my car sat still on a 5 lane highway surrounded by other commuters just as frustrated as I was. Why would anyone want to take a trip right into the traffic capital of the country on a holiday weekend? The answer is simple. Our destination is there. Pastor Adam and I are traveling to Washington D.C. because our denomination’s international convention is there. The commute may be horrible, but the destination is going to be worth it. Sometimes I feel like this life is a long and painful commute. There are some bumps in the road. There are frustrations and disappointments. Things don‘t go the way I wish they would. My plans fall through. My pursuits become slowed down or completely stop. The commute of life can really hurt. Philippians 3:20 says, “For our citizenship is in heaven, from which we eagerly await. . .” Our present commute may often times be difficult. Be encouraged! The destination is well worth it. All of the struggle on our way is nothing compared to the glory of Heaven. Don’t give up! Heaven is worth the commute! I always enjoy watching an evening twilight gradually cast a coolness into the air after a warm summer day. This time of day in the summer months is an added bonus after enduring a very intense amount of direct sunshine. The evening sounds of birds, insects, smells of the garden or hay fields, and even sighs of relief from humans, all equate to a special moment after a well spent day. I know the earlier mornings take on that same pleasant atmosphere of light and coolness also before a full day of work begins. I will always celebrate both times of day with a gratefulness to our Lord for creating such contrasting times that bring such pleasure to my human mind. to take my imagination toward wondering how magnificent heaven could possibly be. If this earth offered moments of pleasure then certainly heaven would offer an eternal time of pleasure for us to partake in. “Then I saw a new heaven and a new earth, for the first heaven and the first earth had passed away, and there was no longer any sea. I saw the Holy City, the new Jerusalem, coming down out of heaven from God, prepared as a bride beautifully dressed for her husband. And I heard a loud voice from the throne saying, ‘Look! God’s dwelling place is now among the people, and he will dwell with them. They will be his people, and God himself will be with them and be their God. He will wipe every tear from their eyes. There will be no more death or mourning or crying or pain, for the old order of things has passed away…’ The city does not need the sun or the moon to shine on it, for the glory of God gives it light, and the Lamb is its lamp” (Revelation 21:I-4,23). All I could muster up with my imagination was this: If God was this creative in making this earth, how much more is being prepared and waiting for us in heaven for those who love the Lord. I don’t think He stopped with love and beauty just outside heaven’s gate!